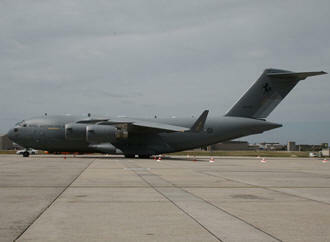 March 3, 2011 - The Australian Defense Materiel Organization has awarded Northrop Grumman Corporation a contract to provide integrated airfield and asset protection solutions for the Royal Australian Air Force C-17 aircraft. Northrop Grumman will deliver its Expeditionary Tactical Automated Security System (ExTASS) for the protection of the Australian C-17s while at home air stations and during expeditionary operations. ExTASS is an implementation of the Tactical Automated Security System (TASS), deployed at more than 100 sites worldwide by the U.S. Air Force, U.S. Army and U.S. Marine Corps. Like TASS, ExTASS is an open architecture, command-and-control platform for the integration of a variety of sensors designed for force-protection missions. The system provides for real-time detection and assessment of intrusions, thus allowing immediate coordination of appropriate response. The ExTASS will be configured in a mobile trailer for quick deployment. "This contract demonstrates the continued cooperation between the U.S. and Australia in the worldwide fight against terrorism," said Michael Danick, programs director with the integrated command, control, communications and intelligence systems business of Northrop Grumman Information Systems sector. "We are proud to expand on our critical infrastructure and force protection capabilities to support the Australian Department of Defense." Northrop Grumman is a leading provider of protection systems such as ExTASS. The company is one of the prime contractors supporting the U.S. Army Counter-Rocket, Artillery and Mortar (C-RAM) program office in other related efforts such as the delivery of the C-RAM sense-and-warn capability to protect U.S. and Australian forces in Afghanistan. Northrop Grumman has well-established relationships with Australia and other countries in the region, where it has been supporting a variety of both defense and civil programs for more than 20 years. Northrop Grumman is a key subcontractor for the Wedgetail AEW&C, F-35 Joint Strike Fighter and the FA/18 Super Hornet programs.